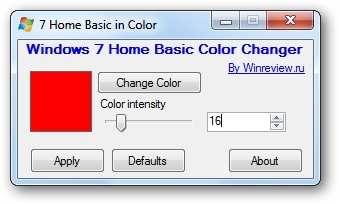 Windows 7 Home Basic Color Changer is a free tiny portable tool that allows you to change the window & taskbar color in Windows 7 Home Basic Edition. Just run the tool, select the color and click Apply. It will then restart Aero & you will be able to see the new color. To restore it to the default color, just click Defaults.